Attendees from the signing ceremony for cooperation MOU between UNIST and KONICOF are posing for a group photo at UNIST. 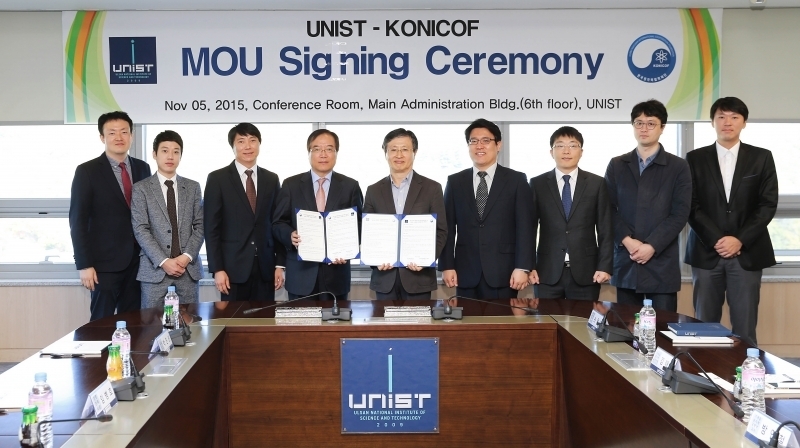 On November 5, UNIST signed a Memorandum of Understanding (MOU) with Korea Nuclear International Cooperation Foundation (KONIKOF) to pledge mutual support for one another in the pursuit of excellence in nuclear security education and nuclear energy related R&D. The ceremony was attended by Prof. Taesung Kim (Dean, School of Mechanical and Nuclear Engineering) of UNIST, Executive Director Jin Seon Park of KONICOF, and ten other administrators of related departments. The primary purpose of this agreement is to strengthen cooperation between the two institutes in peaceful use of nuclear energy in the fields of human resource development and research. The ceremony was held in the main conference room of the UNIST Main Administration building in the afternoon. In the memorandum of understanding, the two institutes agreed to expand cooperation in various areas, including nuclear safety research, next generation nuclear system, fostering nuclear experts, and technologies relating to decontamination, de-construction of nuclear power plants, and etc. Both organizations are determined to facilitate information sharing and learning through the coordication of joint research activities, standardization of nuclear educational resources, and sharing of knowledge resources and materials.